This past weekend, James and I went out on a limb and tried ñame and starfruit. So to continue on this journey of the unknown, I started off the week by giving Wii Just Dance 2 a whirl with my friend Lindsey. Anyone who knows me knows I’m not a dancer. Give me a ball or a bat, and I’m definitely coordinated. But ask me to move freely on my own to the beat of music…and yikes! My body longs for some regimented movement that is practical and works to achieve a goal, especially it if involves competition. But Lindsey has always had a way with getting me out of my comfort zone to try new things, whether it’s dancing, food or fashion. So, after a much-needed preparatory concoction of black raspberry chambord and soda, I got the Wii wand ready for my dancing debut. Besides the fact that I can’t dance, I went into the dance off with other reservations: 1.) Lindsey is such a fluid dancer and picks up any moves that she could practically dance for MTV, and 2.) the living room of her condo has two massive windows sans blinds so that any passersby would see us me flailing around. So I timidly began the dance off to a Rhinana song, and found that even though I lost, my score wasn’t as bad as I was expecting. With every song we tried, there was always one move I continued to get a ‘perfect’ on. And unfortunately, there was only one move every song that I got a ‘perfect’ on. Song after song I lost, but with the final song by Outkast, I managed to barely eek out a win. Don’t ask me how. Most of the song required flailing your arms about, so I pretty much had that move down. After our 30-minute dancing routine, we made salads with blackened shrimp, mango and avocado, which reminded me that I need to cook shrimp more often. Antioxidants help to prevent diseases, such as cardiovascular disease and cancer. They boost immunity, are anti-inflammatory and keep bones and skin healthy. The most powerful antioxidants are phytochemicals. Anthocyanins are the phytochemical that give purple sweet potatoes their distinctive rich color. Anthocyanins from sources such as blueberries and purple sweet potatoes have been shown to be powerful antioxidants, exhibiting greater antioxidant activity than either Vitamin C or Vitamin E. Studies show that purple sweet potatoes have 150% more anthocyanins than blueberries, that’s 2.5 times the punch per serving. Studies also demonstrate that neither the anthocyanin content nor the antioxidant activity of the purple flesh was affected by common cooking methods. James simply cut them into fries, basted with olive oil, sprinkled with cinnamon and baked them at 350 degrees. I personally prefer them with olive oil, salt and parmesan, but these were still good. They didn’t tasted exactly like normal sweet potatoes, but close enough. We enjoyed them with ribeye topped sauteed onions and collard chips, which James just coated with olive oil and sea salt, and baked. 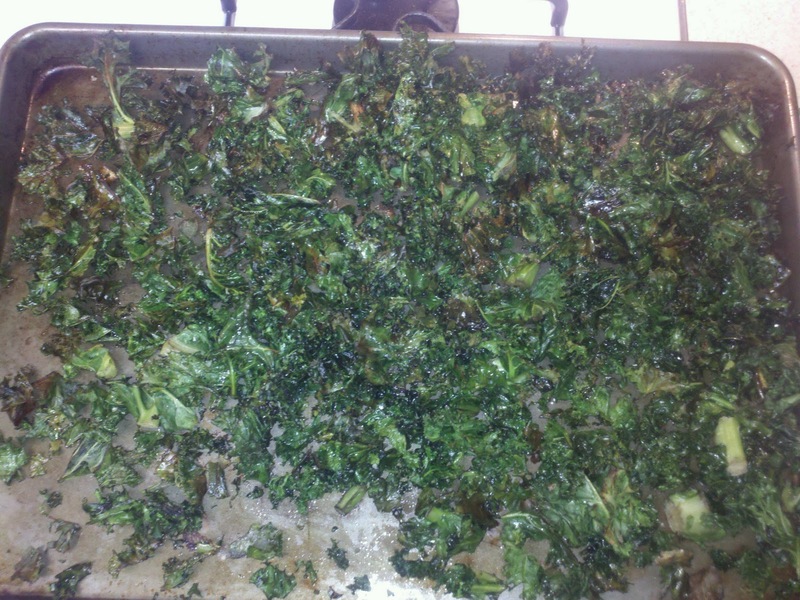 James also recently made kale chips. Since I don’t normally eat kale or collards, I’m loving this new way of preparing them.